The Third Humanity in Harmony-Daniel Pearl World Music Days is set for Sunday October 18 at 2PM at the MacArthur Recital hall at the Flint Institute of Music. The concert will showcase stringed instruments from different cultures stringing diversity together. The project also will feature two master’s programs for students of all ages on Saturday and, for the first time, a featured international journalist. With recent events in the Middle East, and even here in the U.S.A., we are reminded of how dangerous a reporter’s life can be. Daniel Pearl was a journalist; a reporter for the Wall Street Journal who was killed in Pakistan while reporting on the unrest in that part of the world. The story was turned into the film “A Mighty Heart” starring Angelina Jolie as his widow. Daniel Pearl World Music Days is about creating a “dialog in music.” Daniel Pearl was an accomplished violinist! The Daniel Pearl Foundation doesn’t dwell on how he died, but instead keeps his memory alive through music; there are Daniel Pearl World Music Days concerts all over the world. The Flint event is the only one in Michigan. To help focus on this question we will welcome, for the first time, an international reporter as our Journalist in Residence to talk to young people about the importance of reporters bringing news from around the world. 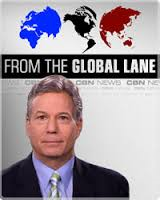 The first Humanity in Harmony Journalist in residence will be Gary Lane, a Flint area native and CBN News’ Chief International Correspondent.